Gardening is another hobby I really enjoy along with cooking. 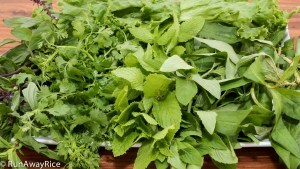 I love it when I can snip herbs from my garden to add fresh flavor and aroma to a dish. As a novice gardener, I keep things small and simple so it’s manageable. I have a planter box garden which my husband built using basic materials from Home Depot. 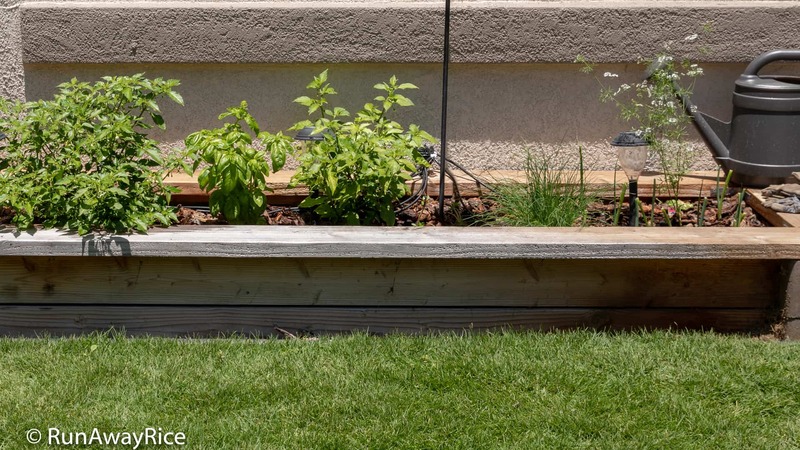 In the planter box I have easy-to-grow herbs and vegetables which require minimal attention, just daily sun and water. Sun is abundant here in San Diego. Water is more scarce and so my garden box has sprinklers timed to water the plants daily. This is especially convenient when I am travelling. In my garden this year is an assortment of herbs, chili peppers, chives and green onions. First up is Thai basil which I just adore. I love the fragrant licorice-tasting leaves. Of course, it’s also a favorite herb in many Vietnamese dishes, like Beef Noodle Soup (Pho Bo) or Thai Basil Chicken (Ga Xao La Que), so it’s awesome to have handy. Last summer because I was travelling so much there was no time for gardening. My Thai basil grew into a huge thistly bush which I had to remove. This spring I planted new Thai basil. The new plant, trimmed weekly, is much more manageable and just so pretty! Next to the Thai basil are two chili pepper plants: habanero and ghost pepper. Both chili peppers are extremely spicy and most people can’t eat them. For me, they’re spicy perfection. I planted these peppers late and so I didn’t get any peppers last year. Having gone through a winter, the pepper plants are now strong and vibrant. So far, I am seeing lots of white flower and a few small peppers. Below is a picture of a budding habanero pepper. Next to the peppers are chives, cilantro and green onions. 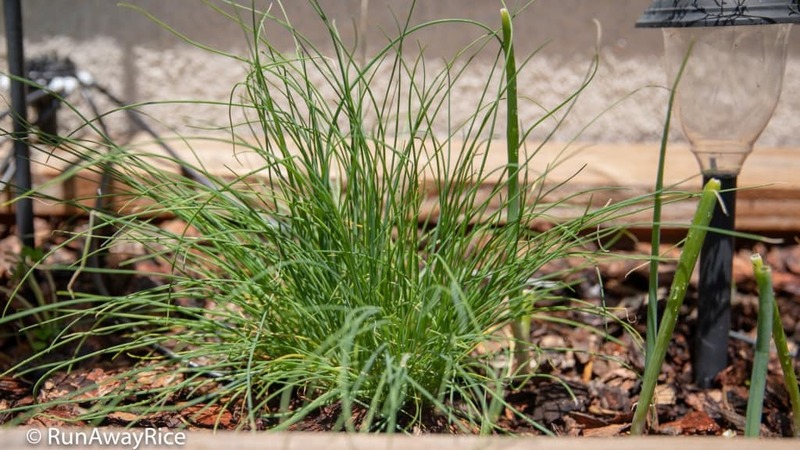 I purchased the chives and cilantro from Lowe’s garden center. Earlier this year, they had a sale on herbs where if you bought 4 plants, the 5th one was free. The herbs are sold in biodegradable containers and super easy to plant. Just tear off the bottom portion and then plant the entire pot in the ground. That’s easy gardening! The green onions are from the grocery store and leftovers from cooking. I put 2 inch root sections in a cup of water for 3 days to let the roots sprout and then planted them in the garden. They grow really quickly and just earlier today, I snipped off some green stems for a salad. Surrounding my yard I have planter beds filled with jasmine bushes. I love the delicate fragrance of the white jasmine flowers. It’s a sweet aroma but not over-powering. 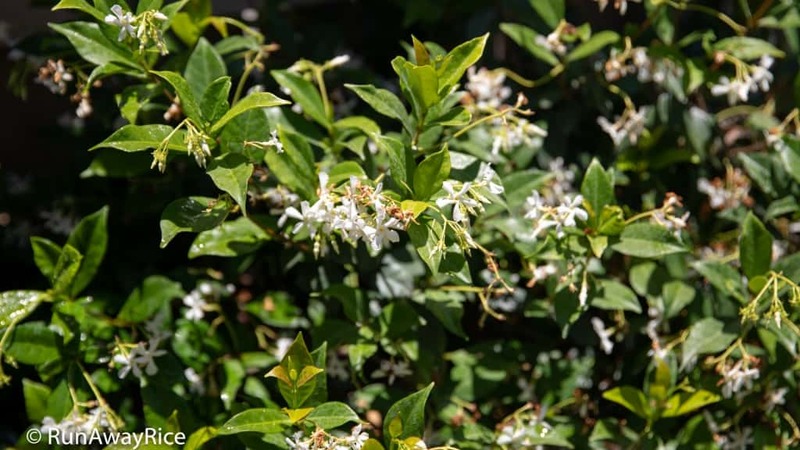 These jasmine bushes are a favorite for California gardens because they require no care and are drought-resistant. 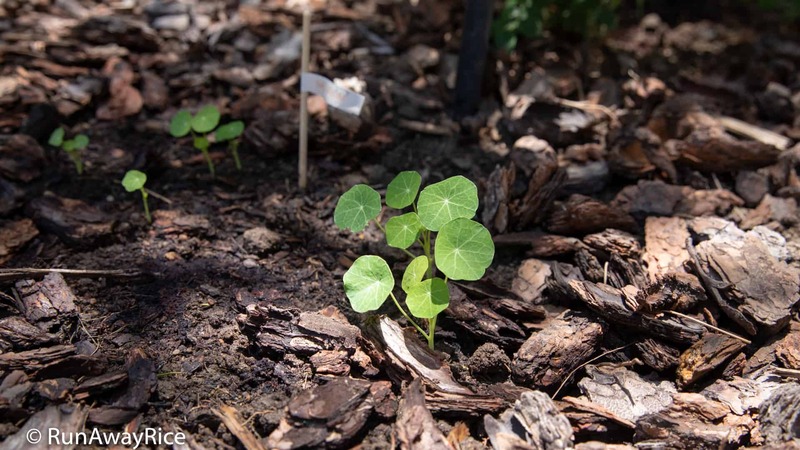 These little green leaves are Nasturium, a beautiful and edible flower. I sprouted these from seeds and the leaves are just a few weeks old. I am looking forward to seeing the pretty flowers which will bloom in later summer. I’ll be sure to share updated pictures. I finally found Lá Cẩm / Magenta Plant / Peristrophe Roxburghiana. These cuttings are from a larger plant I purchased online. Unfortunately, the plant didn’t survive the hot trip from Florida but I managed to root some cuttings. If you’re not familiar with Magenta plant, it has slender leaves which when cooked yield a beautiful magenta color. The magenta liquid is used as natural food coloring in sticky rice dishes and desserts. Fingers-crossed, if my plants survive and I can harvest some leaves, I will share the recipe for making Magenta Sticky Rice (Xoi La Cam) and you can see how gorgeous the color is. 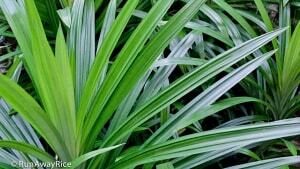 Another recent online purchase is this Pandan plant. This little plant was shipped to me from Texas. It’s taken it a few weeks to perk up but I think it’s finally getting use to its new home. I can see some new growth at the roots. 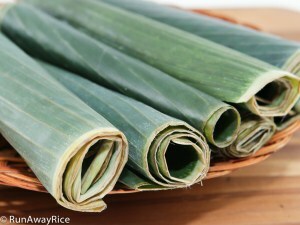 I would love to have fresh Pandan leaves for my recipes instead of having to use the frozen leaves. A garden isn’t complete without a little wildlife. Look at the cute hummingbird who came to visit me today. 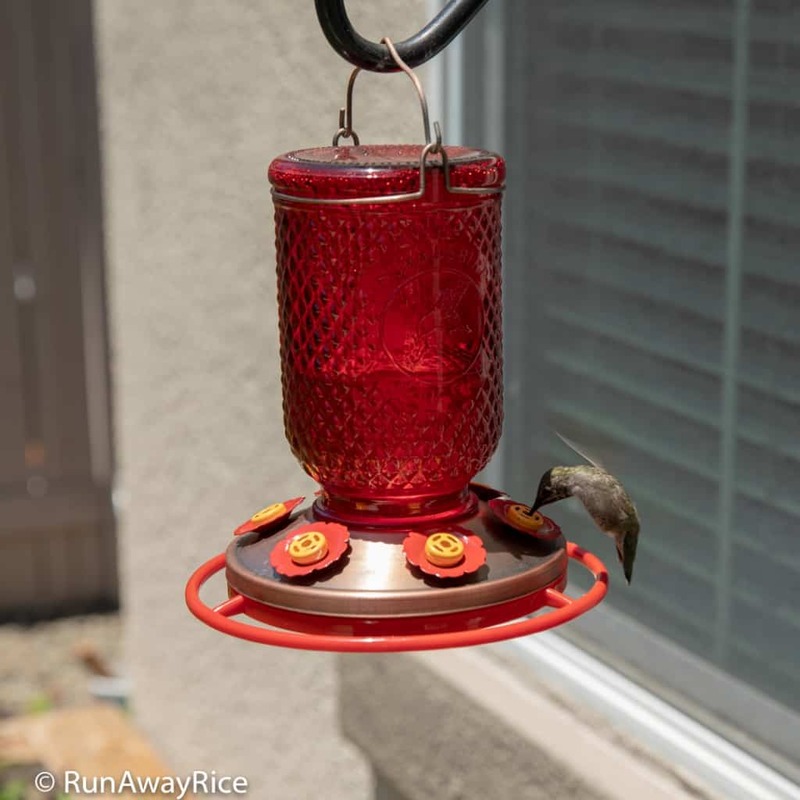 There’s a plethora of hummingbirds visiting daily and I keep the feeder stocked with the delicious nectar they love. I make homemade nectar using this easy recipe: 4 parts water plus 1 part white sugar. 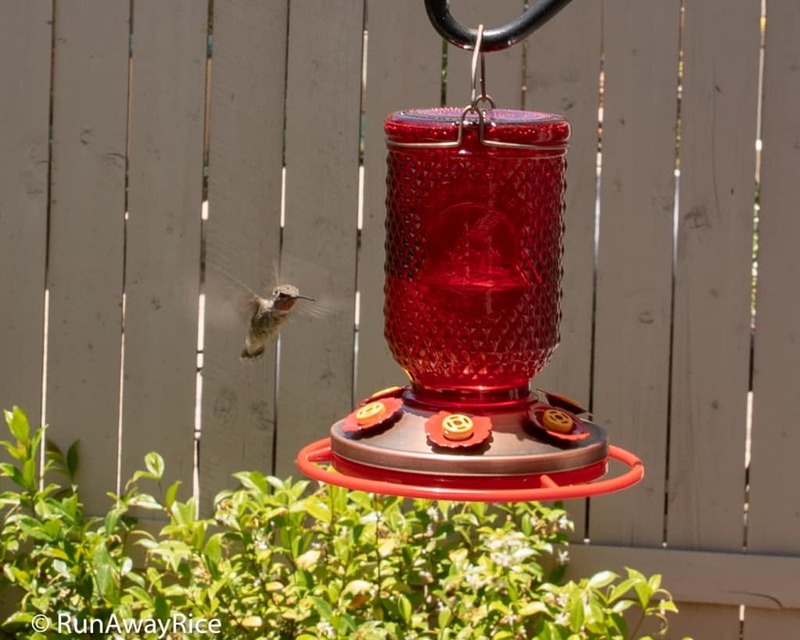 The hummingbirds just love it! It doesn’t have red food coloring (which I heard wasn’t really good for the birds) and much less expensive than the store-bought option. 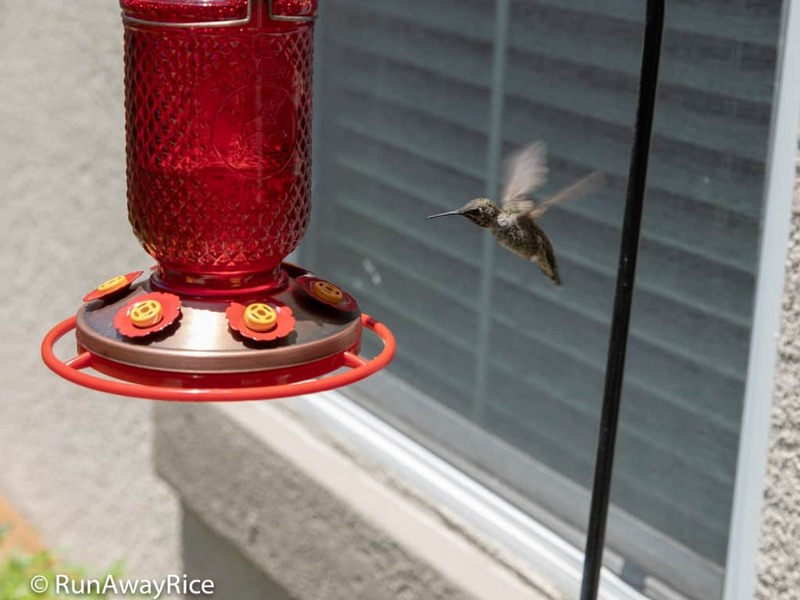 With all the hummingbirds visiting, I have to keep a steady supply. These voracious little birds consume about 4 cups nectar every 2-3 weeks. This lovely fountain completes my Zen garden. I love the soothing sound of trickling water. 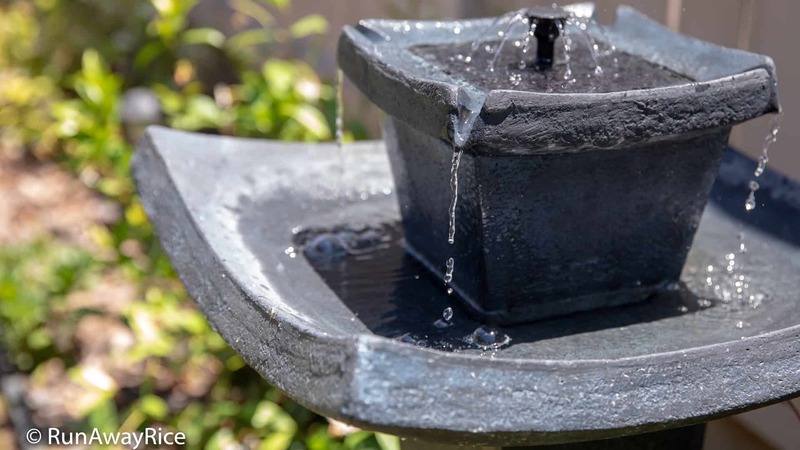 This little fountain is solar-powered so no cords or cables to worry about. 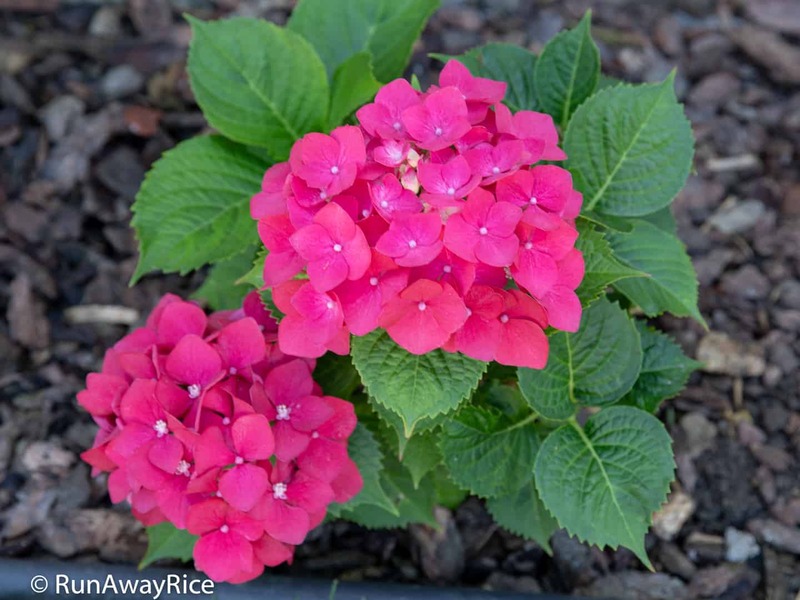 These gorgeous bright pink Hydrangeas add lovely pops of color to my outdoor space. I planted these last year thinking they were annuals and was pleasantly surprised to see them bloom this year. I just adore this happy pink color! Now that I know Hydrangeas are perennial plants, I will have to add a few more. Do you love gardening too? Share with me what’s growing in your garden, what you do to take care of your plants and any tips and tricks. Hello chi Trang, I love your herb garden! Like you, I enjoy gardening very much. There’s nothing quite like picking your own herbs to complete a homemade dish! My late dad gave me a lot of gardening tips too. 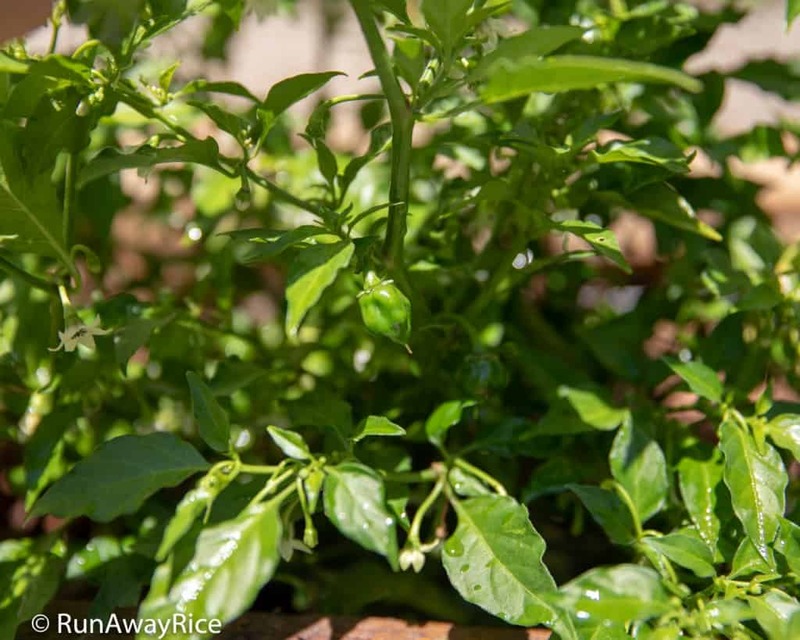 As far as your Thai basil, you may want to pinch off buds as the plant will send nutrient to them. 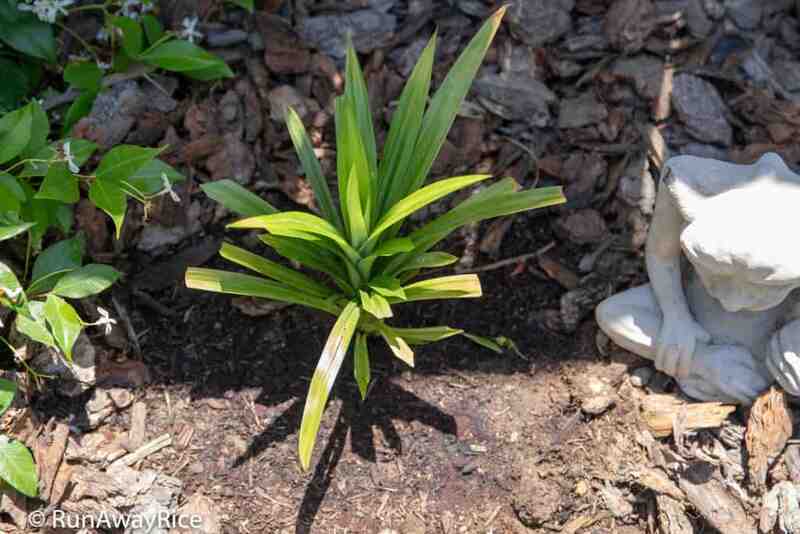 As a result, the leaves will shrink in size and the plant will die thereafter. Hi Ann, I am so glad to hear you love gardening too! What do you grow in your garden? Thank you for sharing the tip about pinching off the buds. 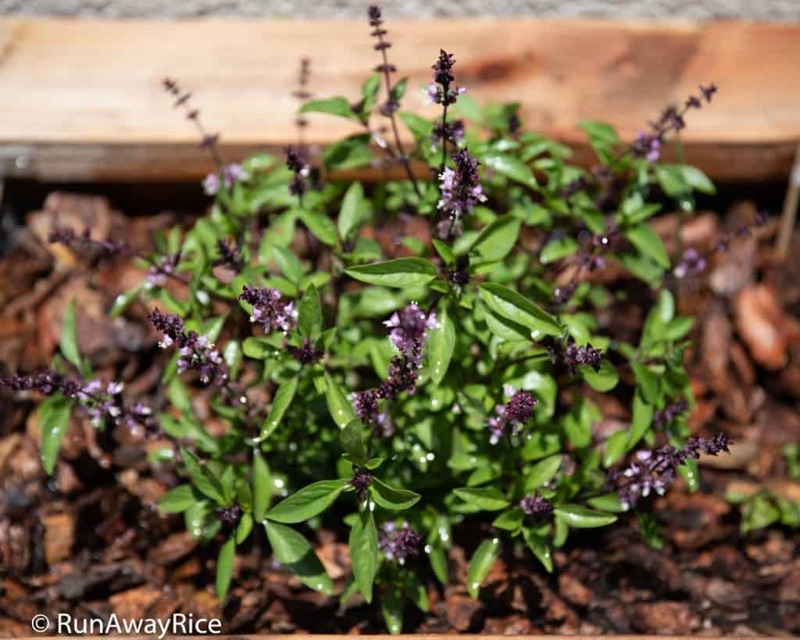 I will certainly do that with my Thai basil to encourage them to grow. Hello chi Trang, although I am an avid gardener, I am still a beginner. However, what lacks in experience made up for in enthusiasm! Here are what I currently plant in my garden: tia to, rau ram, Bac ha, green onions, dwarf Meyer lemon, dwarf lime tree which I bought at Costco this past April), Viet guava tree which produces really yummy guavas each year. ( the seeds were brought over clandestinely by a friend’s mom coming back from Vietnam! 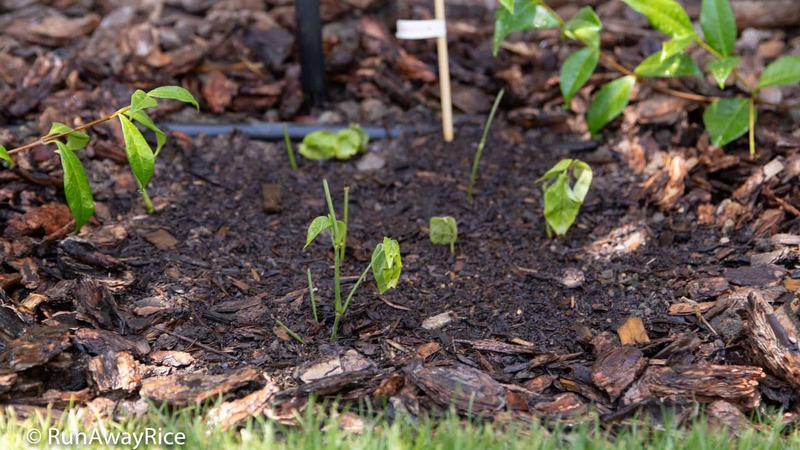 ), chayote (still at an early stage), Keiffer lime tree ( from Costco), Thai basil, lemongrass, a Việt mận tree (the one with the bell shaped fruit . It has yet to produce any fruit though), cobra chili peppers ( ot chi thieng), a dwarf kumquat tree (it produced roughly 70 kumquats just in time for Viet new year early this year), alo vera. I’m trying to root the ngo om and they seem to be doing ok so far. I inherit the love of gardening from my dad. It’s such a great feeling to reap the fruit of your labor, literally. My husband would tease me whenever I bring a new plant or fruit tree home but I would tell him that this hobby of mine is much less expensive than hanging around the bar drinkingAt least everyone benefits from my hobby. You may want to buy a Keiffer lime tree as you can use the leaves in a lot of dishes, Canh chua , goi ga, Canh chua Thái…..We plant the dwarf Keiffer lime in a whiskey barrel and it’s thriving. The leaves are sold packaged in styrofoam for about $65 per pound! You are probably wondering if I also work outside the home and the answer is yes, i do. As in most cases, you just make time for ưhat you love. I forgot to mention to you that we also carve out a section of the garden for my teenage son. He’s planting tia to, srrawberries, lettuce, rau ram and flowers .